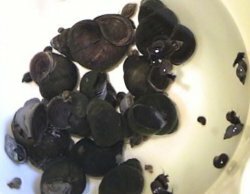 Information on some of the common aquatic snails kept in aquariums and ponds. Where Can I Buy Some Snails and/or Clams? Note: I include the Latin names if I know what they are. If you know any of the Latin names for the species that I do not, please e-mail the information to me. See my algae-eating animals comparison table to make a quick comparison of the various species of algae-eating snails. The pond egg identification guide will help those with ponds determine who made those eggs in the pond. Perhaps it was a snail! This page is for freshwater mollusks. I also have a page on reef snails (saltwater). I added a small section on slugs here because I took a couple photos of a big slug on the siding of the house. Slugs are basically snails without shells. There are many marine sea slugs and some terrestrial slugs. If you can get over the gross factor of their slime, slugs are actually quite interesting. Check out the Wikipedia page on slugs. Slugs prefer to come out during and after a nice rain and at night. They leave slime trails where they crawl. I have touched plenty of slug juice! Slugs lay small eggs in the rocks of my waterfall in the spring. I think the ones that we have are great gray slugs or tiger slugs, Limax maximus . They are native to Europe but now found in a lot of the US. These huge slugs can grow to 8 inches long. The one in my photos is about 4 inches long. 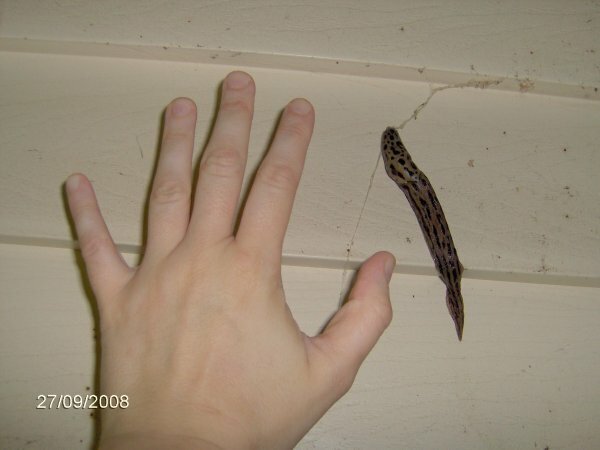 Slug with my hand next to it for comparison. I have small hands. Slug - close-up of the same slug.